Evansburg State Park is in southcentral Montgomery County between Norristown and Collegeville. Evansburg offers a significant area of green space and relative solitude in an urbanized area. 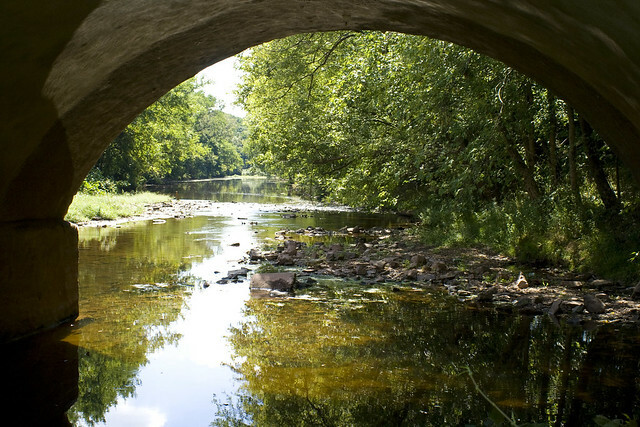 Its main natural feature, the Skippack Creek, has dissected the land into ridges and valleys that create feelings of enclosures and provide scenic views. The first European settlers were Mennonite farmers who powered their industries with the water of the Skippack. Even now, mill remnants, mill buildings, and houses from the eighteenth and nineteenth century dot the park landscape and serve as reminders of early American life. Today, the park is a quilt work of cropland, meadows, old fields, and mature woodlands that attracts day use visitors from the Montgomery County and Philadelphia areas. People come to the open play fields, picnic areas, trails, golf course, and the relatively tranquil, natural environs. The park office is open specific hours. The overnight and other areas are open specific seasons and hours. Contact the park office for facility seasons and hours. From Collegeville, take the Germantown Pike east. Turn left onto Skippack Creek Road and continue to May Hall Road. From Philadelphia, take the Germantown Pike west. Turn right onto Skippack Creek Road and continue to May Hall Road. This activity or structure is ADA accessible. Accessible picnic tables, parking spaces, and sanitary facilities have been designated in the main day use area at May Hall Road.